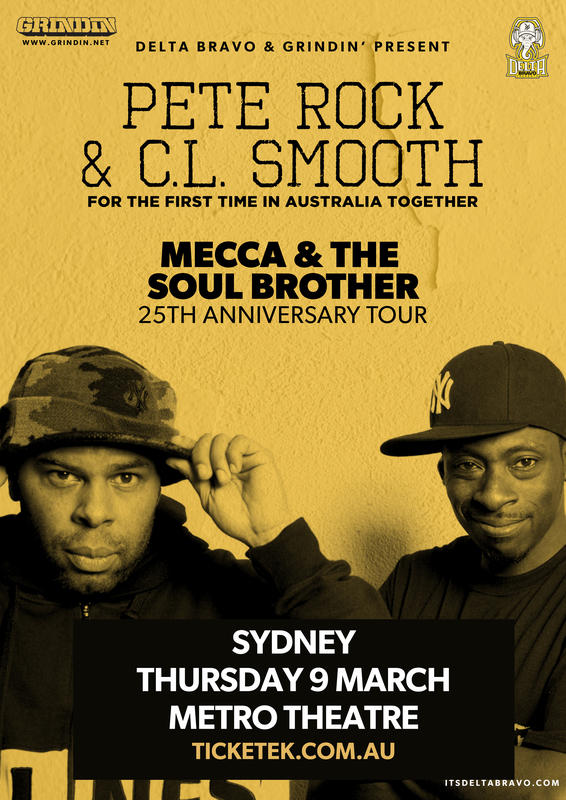 Delta Bravo & Grindin’ are thrilled to announce one of the greatest Hip-Hop duos of all time – Pete Rock & C.L. Smooth, together for the first time in their first ever Sydney show. Emerging from Mount Vernon, New York in the early 90’s, the pair combined Pete Rock’s unique production, which fused intricate soul samples and jazz breaks to create NY’s quintessential boom-bap sound, with CL Smooth’s thought-provoking and philosophical lyrics. This combination saw the duo become one of the most influential and legendary hip-hop groups of all time. Meeting in high school in 1991, the duo released their seminal six-track EP entitled ‘All Souled Out’ which yielded the successful single ‘The Creator’ showcasing Smooth’s oven-crisp voice and avoidance of profanity, opting to bless Rock’s compositions with his deeply philosophical lyrics instead. The vast sampling on ‘All Souled Out’ showcased Rock’s fondness for complex sampling techniques and a taste for obscure soul breaks, an influence he took from his father’s extensive record collection. Their 1992 album ‘Mecca & the Soul Brother’ is regarded as an influential hip-hop classic and featured ‘Straighten It Out’ and ‘They Reminisce Over You (T.R.O.Y. )’ which consistently sits firmly in the top 100 hip-hop songs of all time. A final album was released by the duo in 1994, ‘The Main Ingredient’, before they parted ways to focus on other projects. Both would remain prominent in hip-hop contributing to several movie soundtracks, as well as releasing solo projects; whilst Rock’s production, alongside RZA and DJ Premier, went on to define the East Coast sound. Reuniting in 2016 for the ‘All Souled Out’ tour, the hip-hop legends have toured extensively through Europe and the USA to phenomenal live reviews. The 25th Anniversary of ‘Mecca & The Soul Brother’ is set to entertain not only fans of hip-hop, soul, funk and R&B, but also fans of incredible live music.